Angela Yuan, AAST junior, in front of her research poster on agriculture. Observant drivers passing by the Bergen County Academies may have been confused by the congregation of students, teachers, and parents entering the building on a recent Sunday. Little did these passersby know that inside the building, a bustling science fair was taking place – BCA’s Research Expo! On March 3rd, 2019, BCA research students presented their research projects in front of distinguished judges and their fellow peers for the second annual BCA Research Exposition. The BCA Expo is affiliated with the Intel International Science and Engineering Fair (ISEF). This year, the BCA Research Exposition had three divisions: associate, local, and ISEF. Like last year, participants in the highest division, ISEF, had the opportunity to qualify for the Intel ISEF Symposium and represent BCA. This year, the associate division replaced the novice division that was part of last year’s convention. The associates had one hour to interview other research students who were competing in the local or ISEF division. “[The students competing in the local or ISEF division] l give us some good ideas about what we might want to do with our research. Later today, we’re just presenting our ideas and whatever small amounts of data we have and just learning from each other and seeing how we can improve,” said AMST sophomore Miray Samuel, who was competing as an associate. As for the ISEF and local division competitors, these students had the opportunity to be interviewed by judges and their fellow peers. Woohyun Kwen, an AMST sophomore who competed in the local division, shared that she was excited to meet the judges and was grateful for the opportunity to present her research to experts in the field and learn from their constructive criticism. 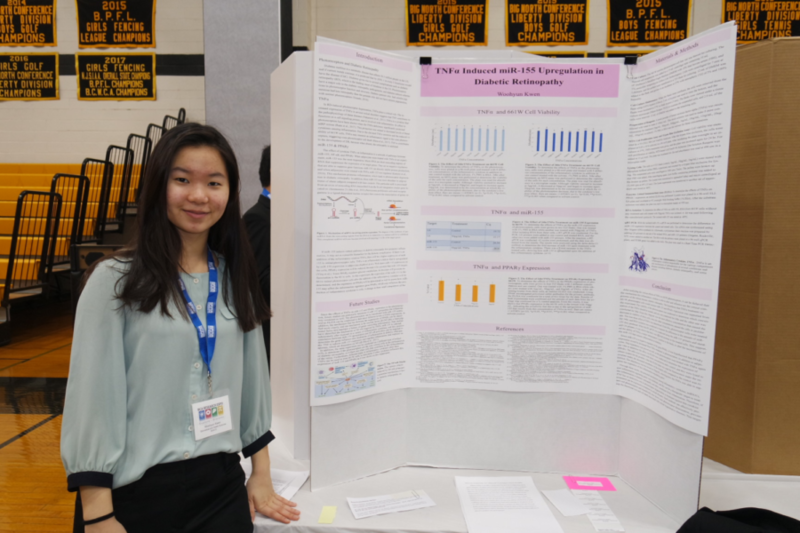 For her research, Woohyun tested photoreceptors to find a possible treatment for diabetic retinopathy, which is a complication of diabetes that causes damage to the blood vessels in the tissue of the retina, or the back of the eye. In order to prepare for the expo, Woohyun said she spent hours in Mrs. Leonardi’s room and worked on her poster until the day before the fair. Jonathan Maeng, a sophomore in AMST, shared that he was confident about the hard work and long hours he had poured into his research. The expo was an opportune occasion for Jonathan to present his research, which was about inducing senescence, a state in which cells irreversibly stop dividing, in glioblastoma tumors. He hypothesized that this would reduce temozolomide resistance and promote sertraline induced apoptosis. Temozolomide is an anti-cancer chemotherapy drug that is ineffective against glioblastoma. Reducing resistance to temozolomide would increase the effectiveness of temozolomide. Sertraline is an antidepressant that also functions to induce apoptosis which is the death of cells. Jonathan admitted that while he felt that his project needed more work, he was still excited to present his research to the judges and learn from the experience. In addition to providing students with a welcoming environment to present their research in front of professionals as an ultimate learning experience, the expo was a great chance for other students to observe what their fellow peers had been working on for the past year or even three. 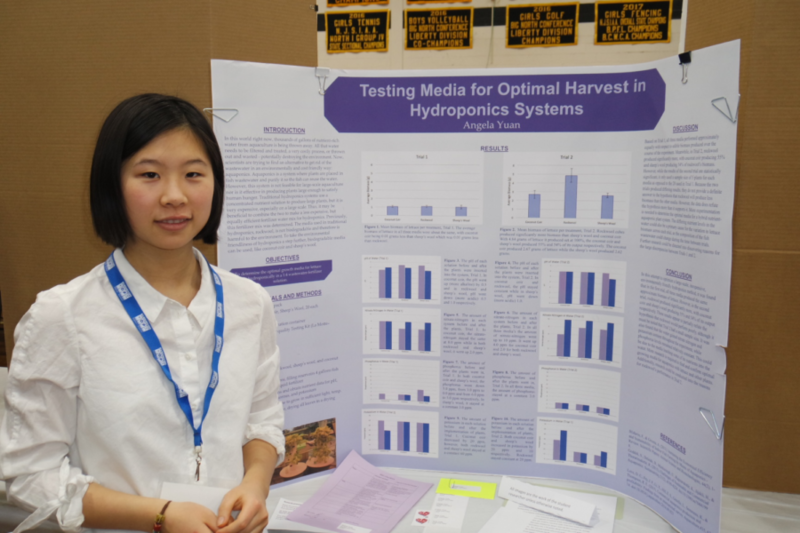 For the competitors, the research expo allowed them to see the fruits of their labor. Through this year’s convention, many BCA students found themselves motivated to improve upon their current research. The BCA Research Expo was the perfect opportunity for students to learn the value of dedication and persistence in carrying out long-term projects. The Expo provided a unique learning curve for students who had just begun research while still being a valuable chance for the more seasoned research students to receive feedback from experts in the field. A special thanks to AMST sophomore Olivia Cho for taking these wonderful photos at the expo!